On Monday, I rode down to Camden Yards for Opening Day. Despite the wind and rain, spirits were high as the Orioles won. Let’s go, O’s! 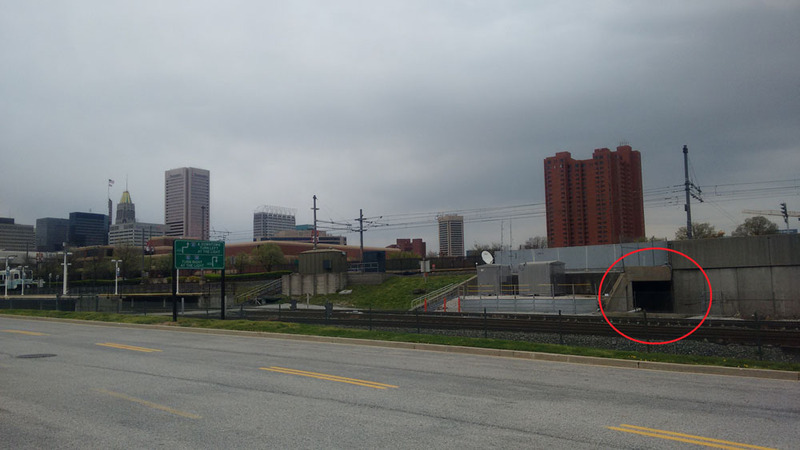 After watching the bustling crowds, seeing the fireworks, and hearing the first pitch, I walked about 300 yards south to Parking Lot C. There, hidden between the MARC and Amtrak passenger lines below 395, is the entrance to the Howard Street Tunnel. This 100+-year-old tunnel runs 1.4 miles from Howard Street to Mt Royal Ave, surfacing between the campuses of the University of Baltimore and MICA. And for the past five years, trains carrying crude oil from North Dakota have been passing through the tunnel on their way to refineries and export terminals in Delaware, New Jersey, and Pennsylvania. This puts hundreds of thousands of Baltimore residents in danger on their way. Across North America, as oil train traffic has increased, so have derailments, punctures, and explosions. Train cars have spilled crude oil into an Alabama swamp, hung from a bridge in Philadelphia, crashed through a building near Pittsburgh and caused the evacuation of over 1,000 people from their homes in North Dakota. A derailment in Lynchburg, VA, spilled 50,000 gallons of oil, setting the James River on fire for hours. The deadliest oil train explosion happened in July 2013 in Lac-Megantic, Quebec when twenty crude oil trains derailed and exploded, incinerating 47 people and flattening 30 buildings. Fortunately, we haven’t seen an oil train incident in Baltimore, but we have an idea of how one might impact the city if we look back 15 years to the Howard Street Tunnel chemical fire. Rail experts have long known that the Howard Street tunnel poses a safety risk. In 1985, a federal transportation safety official told the Baltimore Sun, “the problem would be getting in there to fight the fire … if you had an explosion, fire would shoot out both ends like a bazooka.” Then, in July 2001, a train carrying eight tank cars full of hazardous materials derailed beneath Lombard Street. One car carrying hazardous materials punctured and ignited, setting nearby cars of wood and paper products alight; another car spilled hydrochloric acid on the flames; and a 40” water main above the explosion ruptured, flooding the streets and the tunnel with 14 million gallons of water. People in buildings nearby couldn’t return to their offices for almost a week as the fire burned. Camden Yards was evacuated, and the next three games were canceled. The derailment caused $12 million in total damages to Baltimore. In its report on the tunnel fire, the National Transportation Safety Board stated that safely transporting hazardous materials through the tunnel will “depend upon shared communication and coordination between CSX and the city of Baltimore about the volumes and types of hazardous materials that are transported through the tunnel, anticipation of the types of incidents that might occur, and the capabilities and/or limitations of the city to access the tunnel and respond to any hazardous materials incident in it.” Recommendations included that Baltimore “update and revise emergency preparedness documents to include information on hazardous materials discharge response procedures specific to tunnel environments.” Right now we have the opportunity to make sure our city takes the same steps to understand the risks from and is prepared to respond to an oil train explosion. In May the City Council will consider Bill 16-062, “An Ordinance concerning Transport of Crude Oil by Rail.” It mandates that City departments update incident response plans specifically for oil trains, conduct a health impacts assessment and a risk assessment, develop a mechanism to monitor clean-up in the event of a spill or explosion, and conduct public outreach programs about the risks of a derailment. These basic steps will help us better understand oil train traffic through Baltimore, and give us a firm foundation for further action. Without federal regulations, we can’t stop crude oil trains from traveling through Baltimore, but we can take steps to prevent an oil train tragedy. Contact Mayor Stephanie-Rawlings-Blake today to urge her to support this bill when it reaches her desk. Now that the baseball season has started, up to 45,000 people might be in Camden Yards to watch the Orioles win. Baltimore has already seen a disastrous tunnel fire and a dramatic landslide covering the freight tracks – does Baltimore need to see a third strike before taking action?